Ready to use edible sugar Decorations. Use on cakes, cupcakes, brownies, fruits and other food items. 24pack set complete with sparkle flakes and decorative packaging stickers. 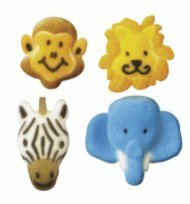 Jungle Animal Assortment Dec-Ons 1 1/4" - 1 1/2"
Jungle Animal Assortment Dec-Ons 1 1/4" - 1 1/2"